Aug 8, 2018 /in Success Newsletters /by Patrick Wanis Ph.D. In this week’s Success Newsletter, I would like to reveal 2 keys to sleeping deeply and peacefully – all night long. Are you heartbroken, angry, lost, lonely, confused, depressed, hung up, or pining over your ex? Do you know how your ex is truly affecting you and do you want to benefit from personalize advice, action steps and revelations? Take my free breakup test and get your own personalized report. What Type of Person Is He Really? Can you trust him? Is he really into you? Is your relationship going to last? A picture is worth a thousand words – find the truth about what your and your partner’s body language reveals via analysis of photos and video. Now, let’s talk about the 2 keys to sleeping deeply and peacefully – all night long. I came across a post on Facebook where someone was asking for help and advice because she was waking up for hours in the middle of the night. She received hundreds of responses from people posting their ideas and suggestions. What did they suggest for how to sleep well and peacefully? They offered everything from using Ambien and Lunesta to cannabis, cannabis oil, various herbs such as valerian, drinking milk, listening to music, reading a book, and doing deep breathing. Yet despite hundreds of responses, no one actually suggested that she deal with the root cause of her sleep disruption. This is something that so many of us do in life – we respond to the symptoms and very rarely even consider getting to the root cause. At least 3 hours prior to sleep, start to wind down. Stop filling your mind with heavy, negative thoughts or conversations. Stop work early and turn your phone off! Avoid watching the news. Remember, if you are using your computer after dark, the light of the computer screen or phone will disrupt your natural circadian rhythms. Your body has specific cycles for day and evening. Search for the setting on your computer or phone to switch on the ‘blue light filter’ at night. Eat dinner early – at least 3 hours before sleeping. Go to sleep the same time each night. The sleep received before midnight is more important than even the sleep you receive after midnight. They discovered that every single one of us (despite our personal misconceptions) actually needs a full 8 hours of sleep, and, you cannot make up for the lost sleep the next day. Thus, if you know you need to wake up at 6 a.m. make sure you go to sleep by 10 p.m. Follow the natural rhythms of your body. Your body naturally reduces the release of cortisol and increases the release of melatonin in the evening following sunset. Your cortisol levels peak around 7 to 8 a.m. When your body releases cortisol in the middle of the night, it will wake you and keep you awake! One of the primary reasons that we wake up in the middle of the night is because we have so many unresolved issues. Calm your spirit by addressing and resolving your issues – daily issues or deeper ones. Do you wake up in the middle of the night with racing thoughts? What are the thoughts that you have when you wake up in the middle of the night? What are the issues that you’ve not yet resolved? What are the things that are creating concern, worry or anxiety? What decisions have you not yet made? What are your fears and doubts? Think about key areas in your life which seem to you either out of control, unbalanced or with which you are dissatisfied. This is the answer to sleeping deeply and peacefully. Deal with these issues during the day. Also, if you are getting ready for bed and you’re already thinking about all the things you have to do the next day, then simply write them out on the list on a piece of paper, and that way you won’t be trying to remember them while you are trying to sleep. Of course, you can supplement the above suggestions with meditation in the early evening (just 15 or 20 minutes) and 5 minutes of slow, gentle deep breathing to relax you. If you need personal help to overcome issues or emotions which are disrupting your sleep, book a one-on-one session with me. You can add to the conversation below. 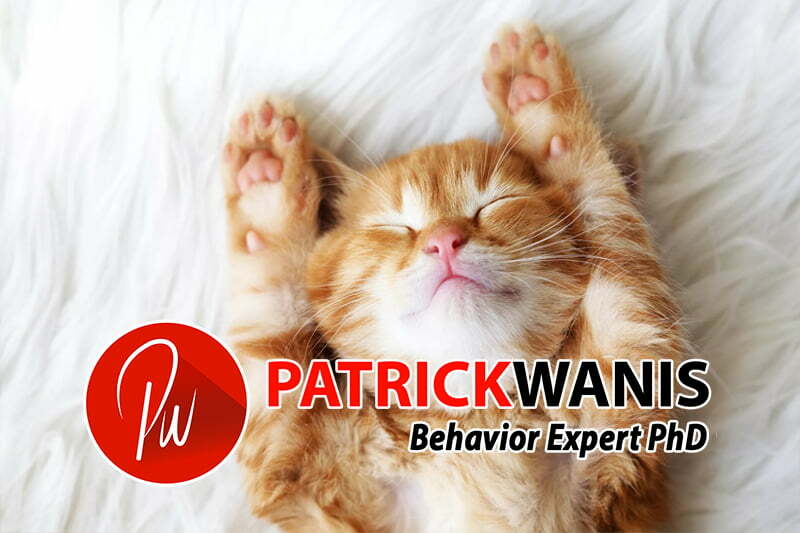 If this newsletter was forwarded to you and would like to receive all of my newsletters please enter your email address on the home page at PatrickWanis.com. Anointed “The Woman Expert” by WGN Chicago, Patrick Wanis PhD is a renowned Celebrity Life Coach, Human Behavior & Relationship Expert who developed SRTT therapy (Subconscious Rapid Transformation Technique) and is teaching it to other practitioners. Wanis’ clientele ranges from celebrities and CEOs to housewives and teenagers. CNN, BBC, FOX News, MSNBC & major news outlets worldwide consult Wanis for his expert insights and analysis on sexuality, human behavior and women’s issues. Wanis is the first person ever to do hypnotherapy on national TV – on the Montel Williams show. What Do Men Want? What Do Women Want?